Tax Justice Network released earlier this week the results of its 2015 Financial Secrecy Index, an in-depth analysis of the levels of transparency and offshore financial activities in jurisdictions through out the globe. 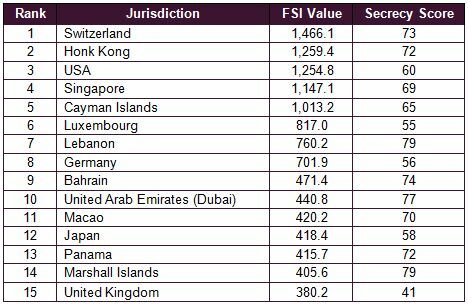 Here’s a small insight with first 15 jurisdictions (of all top 50) in this year’s rankings with Switzerland (once again) topping the list. Switzerland is ranked in first position, based on a high secrecy score of 73 and a large global scale weight for the size of offshore financial services, at around five percent of the world total.